For me as a profound reader of Indian mythology and Ancient history of India, this book came as a pleasant surprise. It was the first for me when I found something so well written that could be swing me back and forth in two very different times so effortlessly. It was almost a perfect setting for the reader to traverse between Ancient and Contemporary India and be able to relate with it through one man, Chanakya, the real architect of Modern India. The story starts in the divided India of 340 BC. A young haunted Brahmin with no moral obligations sets out to avenge the brutal murder of his beloved father. He becomes the biggest political strategist of Bharat and ultimately succeeds in uniting the whole of India against the foreign invader, Alexander and installing Chandragupt on the throne of the mighty Mauryan empire. 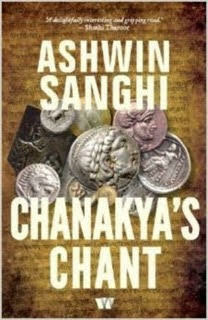 Finally, at peace towards the later part of his life, Chanakya recedes into the shadows to pen down his wisdom as The Arthashastra, the science of wealth. Two and a half millennia later, history repeats itself. Pandit Gangasagar Mishra, a Brahmin teacher in small town India finds buried the engraved chant- ‘Adi Shakti, Namo Namah; Sarab Shakti, Namo Namah; Prithum Bhagvati, Namo Namah; Kundalini Mata Shakti; Mata Shakti, Namo Namah’; the enchantment is said to empower the person to be a kingmaker. Promising the wisdom that Chanakya once had; the wisdom that is buried in the dunes of time, the chants could bestow the immense power to the people who hold those close to their souls. Gangasagar, envigored with such potent force puts all his wits and wisdom into a slum-child, Chandini to present the nation a new leader. The story narration comes to its best when the protagonist (Pandit Gangasagar) sets a perfect game plan, arranging for Chandini, a hindu child’s adoption by a muslim political leader. The way he controls the situation and convinces the leader of another religion by projecting the association as a symbol of peace in an otherwise divided India is exemplary. In his tryst to gain control of the surroundings, he carefully chooses his disciples and implants them strategically in several key positions of the administrative services. Gangasagar makes several friends and enemies during his long and twisted life. The odds go further against him when the foes give a united thrust to his existence. The parts where he counters the seething impact of his enemies puts the reader on edge. The book side-by side opens up the reader’s mind to the events that could have happened during the establishment of Mauryan Empire. Alexander and his conquest, King Porus and his bravery, Seleucus’s vision and his downfall, the Ashwakans and their warfare, breeding of a gang of Mangalik battalion of Vishakanyas- the poison maidens, are the stories which capture the reader’s imagination in a world almost unknown. The book moves back and forth between the two eras and brings out the similarities between modern India and ancient Bharat, both plagued by problems of caste, creed and corruption. How the two kingmakers succeed in their ambitions in such different yet similar environments, plays out interestingly and keeps the reader riveted. Even though the ending is a little predictable, this book is quite a page turner. The book has a fluid storyline and is full of witty dialogues, ingenious twists and cunning politics. I loved the book for the reason I stated in the start. You find your own reason to love or hate the book. One thing though I could bet on is, once started, you will end up reading the whole of it J. Keep on reading.